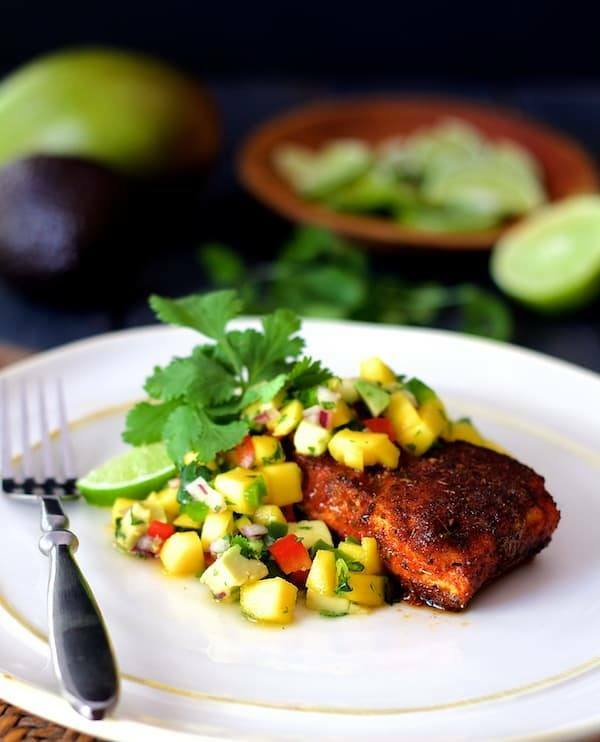 Blackened Halibut with Mango and Avocado Salsa is sure to become your new favorite fish dish! You’ll never buy blackening spice again once you try this homemade blend! BLACKENING MIX: Combine ingredients in a small bowl; set aside. FISH AND SALSA: Preheat oven to 350 degrees. Pat fish dry then season liberally with blackening mix. Heat a cast iron skillet over medium-high heat until very hot. Add the butter and oil. As soon as the butter melts, add fish to skillet. Cook 2 minutes per side. Transfer to a baking pan, place in oven and cook 5 to 7 minutes or until fish flakes easily with a fork. Meanwhile, combine salsa ingredients in a bowl; serve with fish.